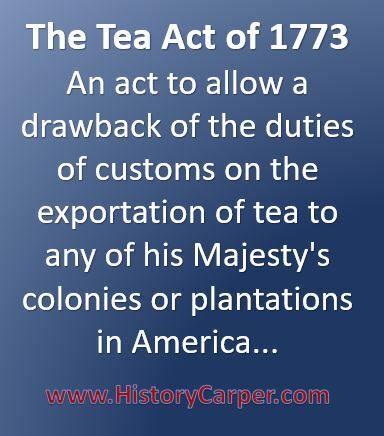 An act to allow a drawback of the duties of customs on the exportation of tea to any of his Majesty’s colonies or plantations in America; to increase the deposit on bohea tea to be sold at the India Company’s sales; and to impower the commissioners of the treasury to grant licenses to the East India Company to export tea duty-free. Whereas by an act, made in the twelfth year of his present Majesty’s reign, (intituled, An act for granting a drawback of part of the customs upon the exportation of tea to Ireland, and the British dominions in America; for altering the drawback upon foreign sugars exported from Great Britain to Ireland; for continuing the bounty on the exportation of British-made cordage; for allowing the importation of rice from the British plantations into the ports of Bristol, Liverpoole, Lancaster, and Whitehaven, for immediate exportation to foreign parts; and to impower the chief magistrate of any corporation to administer the oath, and grant the certificate required by law, upon the removal of certain goods to London, which have been sent into the country for sale;) it is amongst other things, enacted, That for and during the space of five years, to be computed from and after the fifth day of July, one thousand seven hundred and seventy-two, there shall be drawn back and allowed for all teas which shall be sold after said fifth day of July, one thousand seven hundred and seventy-two, at the publick sale of the united company of merchants of England trading to the East Indies, or which after that time shall be imported, by licence, in pursuance of the said therein and hereinafter mentioned act, made in the eighteenth year of the reign of his late majesty King George the Second, and which shall be exported from this kingdom, as merchandise, to Ireland, or any of the British colonies or plantations in America, three-fifth parts of the several duties of customs which were paid upon the importation of such teas; which drawback or allowance, with respect to such teas as shall be exported to Ireland, shall be made to the exporter, in such manner, and under such rules, regulations, securities, securities, penalties and forfeiture, as any drawback or allowance payable out of the duty of customs upon foreign goods exported to foreign parts, was, could, or might be made, before the passing of the said act of the twelfth year of his present Majesty’s reign, (except in such cases as are otherwise therein provided for:) and whereas it may tend to the benefit and advantage of the trade of the said united company of merchants of England trading to the East Indies, if the allowance of the drawback of the duties of customs upon all teas fold at the publick sales of the said united company, after the tenth day of May, one thousand seven hundred and seventy-three, and which shall be exported from this kingdom, as merchandise, to any of the British colonies or plantations in America, were to extend to the whole of the said duties of customs payable upon the importation of such teas; may it therefore to please your Majesty that it may be enacted; and be it enacted by the King’s most excellent majesty, by and with the advice and consent of the lords spiritual and temporal, and commons, in this present parliament assembled, and by the authority of the same, That there shall be drawn back and allowed for all teas, which from and after the tenth day of May, one thousand seven hundred and seventy-three, shall be sold at the publick sales of the said united company, or which shall be imported by license, in pursuance of the said act made in the eighteenth year of the reign of his late majesty King George the Second, and which shall, at any time hereafter, be exported from this kingdom, as merchandise, to any of the British colonies or plantations in America, the whole of the duties of customs payable upon the importation of such teas; which drawback or allowance shall be made to the exporter in such manner, and under such rules, regulations, and securities, and subject to the like penalties and forfeitures, as the former drawback or allowance granted by the said recited act of the twelfth year of his present Majesty’s reign, upon tea exported to the said British colonies and plantations in America was, might, or could be made, and subject to by the said recited act, or any other act of parliament now in force, in as full and ample manner, to all intents and purposes, as if the several clauses relative thereto were again repeated and reenacted in this present act. II. And whereas by one other act made in the eighteenth year of the reign of his late majesty King George the Second, (intituled, An act for repealing the present inland duty of four shillings per pound weight upon all tea fold in Great Britain; and for granting to his Majesty certain other inland duties in lieu thereof; and for better securing the duty upon tea, and other duties of excise; and for pursuing offenders out of one county into another,) it is, amongst other things, enacted, That every person who shall, at any publick sale of tea made by the united company of merchants of England trading to the East Indies, be declared to be the best bidder for any lot or lots of tea, shall, within three days after being so declared the best bidder or bidders for the same, deposit with the said united company, or such clerk or officer as the said company shall appoint to receive the same, forty shillings for every tub and for every chest of tea; and in case any such person or persons shall refuse or neglect to make such deposit within the time before limited, he, she, or they, shall forfeit and lose six times the value of such deposit directed to be made as aforesaid, to be recovered by action of debt, bill, plaint or information, in any of his Majesty’s courts of record at Westminster, in which no essoin, protection, or wager of law, or more than one imparlance, shall be allowed; one moiety of which forfeiture shall go to his Majesty, his heirs and successors, and the other moiety to such person as shall sue or prosecute for the same; and the sale of all teas, for which such deposit shall be neglected to made of aforesaid, is thereby declared to be null and void, and such teas shall be again put up by the said united company to publick sale, within fourteen days after the end of the sale of teas at which such teas were sold; and all and every buyer or buyers, who shall have neglected to make such deposit as aforesaid, shall be, and is and are thereby rendered incapable of bidding for or buying any teas at any future publick sale of the said united company: and whereas it is found to be expedient and necessary to increase the deposit to be made by any bidder or bidders for any lot or lots of bohea teas, at the publick sales of teas to be made by the said untied company; be it enacted by the authority aforesaid, That every person who shall, after the tenth day of May, one thousand seven hundred and seventy-three, at any publick sale of tea to be made by the said united company of merchants of England trading to the East Indies, be declared to be the best bidder or bidders for any lot or lots of bohea tea, shall, within three days after being so declared the best bidder or bidders for the fame, deposit with the said united company, or such clerk or officer as the said united company shall appoint to receive the fame, four pounds of lawful money of Great Britain for every tub and for every chest of bohea tea, under the same terms and conditions, and subject to the same forfeitures, penalties, and regulations, as are mentioned and contained in the said recited act of the eighteenth year of the reign of his said late Majesty. III. And be it further enacted by the authority aforesaid, That it shall and may be lawful for the commissioners of his Majesty’s treasury, or any three or more of them, or for the high treasurer for the time being, upon application made to them by the said united company of merchants of England trading to the East Indies for that purpose, to grant a licence or licences to the said united company, to take out of their warehouses, without the fame having been put to sale, and to export to any of the British plantations in America, or to any parts beyond the seas, such quantity or quantities of tea as the said commissioners of his Majesty’s treasury, or any three or more of them, or the high treasurer for the time being, shall think proper and expedient, without incurring any penalty or forfeiture for so doing; any thing in the said in part recited act, or any other law, to the contrary notwithstanding. IV. And whereas by and act made in the ninth and tenth years of the reign of King William the Third, (intituled, An act for raising a sum not exceeding two millions, upon a fund, for payment of annuities, after the rate of eight pounds per centum per annum; and for settling the trade to the East Indies,) and by several other acts of parliament which are now in force, the said united company of merchants of England trading to the East Indies are obliged to give security, under their common seal, for payment of the duties of customs upon all unrated goods imported by them, so soon as the same shall be sold; and for exposing such goods to sale, openly and fairly, by way of auction, or by inch of candle, within the space of three years from the importation thereof: and whereas it is expedient hat some provision should be made to permit the said united company, in certain cases, to export tea, on their own account, the British plantations in America, or to foreign parts, without exporting such tea to sale here, or being charged with the payment of any duty for the same; be it therefore enacted by the authority aforesaid, That from and after the enacted by the authority aforesaid, That from and after the passing of this act, it shall and may be lawful for the commissioners of his Majesty’s treasury, or any three or more of them, or the high treasurer for the time being, to grant a licence or licences to the said united company, to take out of their warehouses such quantity or qualities of tea as the said commissioners of the treasury, or any three or more of them, or the high treasurer for the time being, shall think proper, without the same having been exposed to sale in this kingdom; and to export such tea to any of the British colonies or plantations in America, or to foreign parts, discharged from the payment of any customs or duties whatsoever; any thing in the said recited act, or any other act to the contrary notwithstanding. V. Provided always, and it is hereby further enacted by the authority aforesaid, That a due entry shall be made at the custom-hose, of all such tea so exported by licence, as aforesaid, expressing the quantities thereof, at what time imported, and by what ship; and such tea shall be shipped for exportation by the proper officer for that purpose, and shall, in all other respects, not altered by this act, be liable to the same rules, regulations, restrictions, securities, penalties, and forfeiture, as tea exported to the like places was liable to before the passing of this act: and upon the proper officer’s duty, certifying the shipping of such tea to the collector and comptroller of his Majesty’s customs for the port off London, upon the back of the licence, and the exportation thereof, verified by the oath of the husband or agent for the said united company, to be wrote at the bottom of such certificate, and sworn before the said collector and comptroller of the customs, (which oath they are hereby impowered to administer,) it shall and may be lawful for such collector and comptroller to write off and discharge the quantity of tea so exported from the warrant of the respective ship in which such tea was imported. VI. Provided nevertheless, That no such licence shall be granted, unless it shall first be made to appear to the satisfaction of the commissioners of his Majesty’s treasury, or any three or more of them, or the high treasurer for the time being, that at the time of taking out such teas, for the exportation of which a licence or licences shall be granted, there will be left remaining not less than ten millions of pounds weight; any thing herein, or in any other act of parliament; contained to the contrary thereof notwithstanding.